Hello 2016! And what better way to start the new year than with a rustic, winter-themed New Year's Day wedding cake. Frosted berries, chocolate pinecones (I'm sure they tasted amazing) and a stunning magnolia blossom all came together to accent the three, hand-painted birch tree tiers. With each tier boasting it's own flavor, (Chocolate Cake with Mocha Buttercream, French Vanilla Cake with Amaretto Buttercream and Carrot Cake with French Vanilla Buttercream), all the guest were sure to find something they loved. Congratulations Elaine and Ryan! 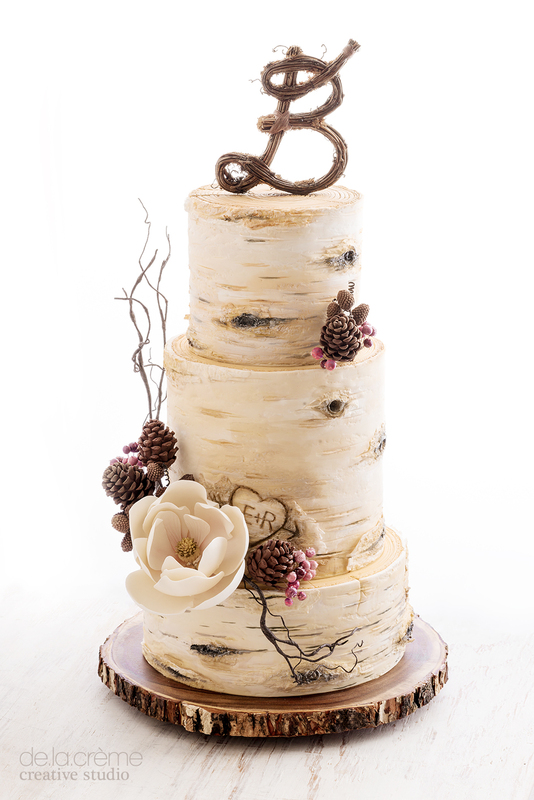 EDIT: A tutorial is available for the Birch Tree Texture and Chocolate Pinecones! Edible Pinecones — handmade piece by piece from modeling chocolate. Hidden amongst the floral cluster, the couple's initial could be seen carved into the "tree"